When you visit a new dentist in State College for the first time, it can give you a bit of anxiety. The uncertainty of the unknown can make you a little uneasy about your upcoming appointment; however, you have nothing to fear. To help you feel at ease, here is what you can expect during your initial visit. From the moment you walk into the office, you are greeted by a caring and friendly team of receptionists. After you register at the front desk, you are given a new patient packet to fill out. This is necessary to gather important information about your oral and medical history as well as your personal and insurance information. If you have any questions about the paperwork, do not hesitate to ask for help. Besides the dentist, your oral health also relies on the care you receive from your hygienist. 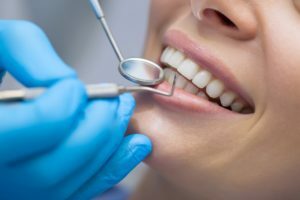 As a valuable dental professional, they clean your teeth and help make recommendations to improve your oral hygiene habits in between appointments. They also take x-rays, which allows your dentist to see all your oral structures, including issues that may not be visible from the surface. The hygienist uses special dental tools to remove plaque and tartar accumulations you cannot reach at home, like below the gum line. Your teeth are polished to leave you with a squeaky-clean smile. They may recommend additional preventive treatments to help protect your teeth, such as a fluoride treatment. This helps to strengthen your enamel to ward off tooth decay. Your dentist takes the time to carefully review your x-rays and performs a visual examination of your teeth and gums. They look at every detail to detect any potential concerns while they are still small, like the earliest stage of gum disease. Besides the health of your teeth and gums, they also perform an oral cancer screening. They examine the soft tissues to look for any concerning areas, like bumps, rough patches, sores, or changes to the tissue color. After your examination, your dentist takes the time to discuss their findings with you while also listening to any of your questions or concerns to help you understand the results of your checkup. You work together to create a treatment plan that accommodates your needs. If you are visiting a new dentist, there is no need to worry. You will enjoy a stress-free visit to help you reach your oral health goals. If you have questions or concerns before your appointment, do not hesitate to contact your dentist to get the peace of mind you need to feel confident during your visit. Dr. Kevin Labosky provides compassionate, high-quality dental care to patients of all ages to create lifelong healthy smiles. He strives to help his patients feel relaxed during their appointments and confident in their oral health decisions. If you need a new dentist, choose the comprehensive, comfortable care you can trust. Contact our office today to schedule an appointment.